Assigned to 3rd battalion, 75th Ranger Regiment out of Fort Benning, Georgia, Sergeant Conneway started his military career by joining the Junior ROTC in high school. It was the first step in fulfilling his dreams of becoming an Army Ranger and following the footsteps of his grandfather, father and older brother into military service in defense of his country. 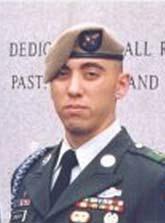 After graduation, Conneway enlisted in 1999 then completed the Basic Airborne Course and the Ranger Indoctrination Program before joining his unit in January 2000. During combat operations in both Iraq and Afghanistan, he served as a rifleman, machine gunner and team leader of the 75th Rangers, Company B, an elite Army light-infantry unit that travels the globe to support the Global War on Terrorism. On June 26, 2003, the 22-year-old soldier from Enterprise, Alabama was traveling in a government vehicle when it struck and detonated an improvised explosive device that was concealed along the side of the road. His injuries proved too much to overcome and he died two days later on June 28. Conneway was posthumously awarded the Bronze Star Medal with Valor device, a Purple Heart and the Meritorious Service Medal along with 14 additional commendations and decorations earned during his four years of service. Conneway’s son is a Folds of Honor scholarship recipient.